The cool dog tricks below are easy to teach your dog. Just pick the one you think your Miniature Schnauzer is up to learning and start having fun with trick training. If you haven't done so yet, be sure and review our dog training tips, before beginning. Everybody wants their dog to know how to SHAKE and it's one of the easiest cool dog tricks to teach your Miniature Schnauzer. It’s just a matter of repetition. Have your Miniature Schnauzer SIT in front of you. Say SHAKE and take your Schnauzer's paw with your hand. Give an enthusiastic verbal praise: Good Boy & your Schnauzer's name. At first, your Miniature Schnauzer won’t understand what he did right. Command: SIT - SHAKE - TAKE PAW - PRAISE. After about 5 times of doing it this way, instead of taking your Schnauzer's paw, simply hold your hand out and wait for him to raise his paw on his own. When he does – PRAISE your Schnauzer big time! This cool dog trick will have your Miniature Schnauzer dog pushing items with his nose in no time! dog trick training tip: Start with a ball that's too big for your Miniature Schnauzer to pick up with his mouth. To teach your Miniature Schnauzer how to PUSH IT begin by touching the ball lightly with your index finger and giving it a small push. At the same time say PUSH IT in a light, friendly voice. Your Miniature Schnauzer will nose or paw at the ball, since he cannot pick it up *(see dog training tip above). When your Schnauzer tries to nose or paw at the ball, reward him with a treat and/or praise. Encourage your Schnauzer to push the ball again. Say PUSH IT and wait for him to push the ball along. Give your Miniature Schnauzer lots of verbal praises every time he does what you want. You can also buy a dog treat ball for your Miniature Schnauzer to practice this trick. 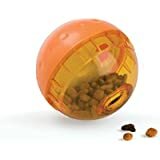 A treat ball is a great way to help keep your Schnauzer entertained and at the same time he rewards himself, in the process for pushing it around. Have your dog SIT and WAIT. Go hide in another room and then call your Miniature Schnauzer to you one time with an inquisitive light tone: "Where’s Mommy?" Wait for your Schnauzer to find you and when he does, praise with excitement for a job well done. dog trick training tip: If your Miniature Schnauzer cannot find you and goes completely off in a different room searching, let him hear your voice once more "Where’s Mommy?" Have your Schnauzer in a SIT-STAY. Show your Schnauzer the dog toy or object you are going to hide. Go hide the object in another room. Go back to your Miniature Schnauzer and release him from his SIT-STAY and say FIND IT. Miniature Schnauzers love a good game of Hide-n-Seek or performing the FIND IT trick. Don't forget to treat your Schnauzer! note: Dog games or tricks like Find It or Pick One (as shown in the video below) are also helpful when working with a blind dog since they require the use of smell. This cool dog trick will have your Miniature Schnauzer helping you clean up the house! dog training tip: Your Miniature Schnauzer should know how to retrieve before beginning this trick. 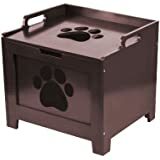 If you don’t already have a toy chest where your dog toys are kept, get a box ready and place it where you want the toy box area to be, permanently. Take up to 5 dog toys and scatter them about 10 feet away from the toy chest or toy box. Standing next to the toy box, have your Miniature Schnauzer retrieve one of the toys and place it in your hand. Take the dog toy and drop it inside the toy box and say Pick Up Your Toys. Next, have your Schnauzer retrieve another toy but upon his return point inside the toy chest & say: Pick Up Your Toys. When he drops the toy in or even close by the toy chest give your Schnauzer a treat and send him off to retrieve yet another dog toy. Once your Miniature Schnauzer has mastered this procedure, you will no longer need to point inside the chest. Just simply command “Pick Up Your Toys” and your Schnauzer will retrieve his dog toys and place them inside the toy chest! Don’t forget to treat your Schnauzer for another job well done! note: Your Miniature Schnauzer must know the DOWN command prior to learning this cool dog trick. Have your Schnauzer lie down. Hold a treat just 6 inches in front of his nose and say CRAWL. As your Schnauzer tries to extend his neck towards the dog treat, slide your hand holding the dog treat back a few more inches and say CRAWL. When your Schnauzer's body moves even a little bit towards you give him the treat and praise: GOOD BOY & use your dog's name. Repeat this process adding a few more inches of distance between your hand holding the treat and your Schnauzer. Always keep the treat low to the ground and in front of your dog. Say CRAWL - wait for the proper motion from your Miniature Schnauzer and offer up a verbal praise and treat! dog training tip: If your Schnauzer starts to stand to get the treat say NO or uh-uh and put your Schnauzer back in the down position and start from the beginning. WARNING: This cool dog trick is one you may NOT want to teach your Schnauzer – especially if he seems to have mastered it all by himself in your flower garden! LOL! Get a hand towel and a few treats or kibble. Have your Miniature Schnauzer SIT in front of you. Place the 2 dog treats on the floor in front of your Schnauzer and let him observe you covering them up with the towel. Hold the towel down, firmly in place on either end, and say DIG. Don’t let your Miniature Schnauzer use his nose to get under the towel. Keep holding the towel over the dog treats. Say DIG again. Your Schnauzer will start pawing at the towel. As soon as he does, release your hands from the towel and say: Good Boy - DIG. Let your Schnauzer have his treat! And then try it again. Practice commands and cool dog tricks daily but remember to keep training sessions short so they are always fun for both you and your Miniature Schnauzer. Start training your dog right now with this free video series by a professional dog trainer and behavioral specialist.